Campers and hunters love being outside, but they don’t love being cold while outside. GrabAGun understands that cold hands and feet are more than just uncomfortable; they can turn into a real problem if allowed to stay cold for long periods of time. 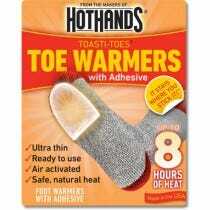 Prevent frostbite and other complications with our hand and foot warmers. There are a variety of ways to heat up your hands on cold days, and a pair of great gloves can often do the trick. However, you can expedite the process with items like Coghlans Disposable Hand Warmers, a great way to receive some extra heat without the bulky equipment. Heatmax also makes a handheld heat bag perfect for the extra warmth your hands need; just activate the pouch and enjoy the heat it generates. In addition to keeping your hands warm, it is smart to remember to warm your feet. A variety of foot warmers can be found in GradAGun’s large inventory. Heated insoles for under your feet and pads that are placed on top can all be found within our catalogue. GrabAGun also offers handheld electronic equipment made to emit heat. The Jon-E 700700 Hand Warmer is a small handheld heating device that works great to keep your whole hand warm. A variety of electric socks can also be purchased and used to keep your feet comfortably warm on the cold days in the woods. Our supplies include warmers for other parts of the body as well, because we understand that it isn’t just the hands and feet that get cold on chilly days. When you are out hunting and camping and need the extra protection from the cold, let GrabAGun be your source for the hand and foot warmers that will keep you cozy on the brisk days in the woods.